Wildberry fragrances to celebrate New Orleans and Mardi Gras! Some luscious new Wildberry fragrances have arrived! This new collection of five scents celebrates New Orleans and the tradition of Mardi Gras. These intense, inviting new fragrances also include a lot of sparkle with glitter on the end to get attention from your customers. Bourbon Street – A deep woody scent with notes of whiskey, subtle butterscotch and oak barrel. Carnival – The juicy scent of a Hurricane Cocktail. A delicious burst of fruit fragrance with balmy notes of tropical fruit, succulent citrus, red apple, sweet jasmine and musk. Harlequin- A hypnotic fruit and floral blend with sultry notes of dragon fruit, juicy peach, soft rose petal, violet leaf and delicate sandalwood. King Cake – Sugared spice decadence. A delectable cinnamon sugar scent with notes of fresh churned butter, agave nectar, powdered sugar and vanilla bean. Spanish Moss- A clean woody scent with bright notes of orange, amber, vanilla, cedar wood, patchouli and sandalwood. 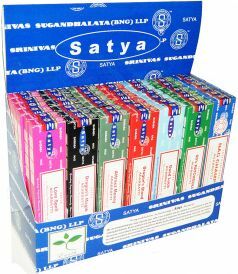 The Satya incense company has come out with new incense fragrances in the 15 gram box size. 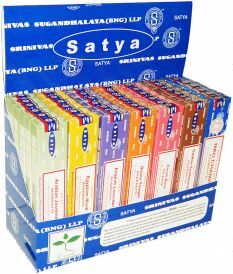 There are a lot of really amazing new fragrances like Love Spell and Good Luck, and also some remakes of old favorites like Sixties Patchouli and Golden Sandalwood.